Charlottesville City Schools shuts down all schools for two days in a row due to the threat. A 17-year-old boy was arrested Friday for allegedly making online threats against black and Hispanic students at a high school in Charlottesville, Virginia, police said. The arrest came after the Charlottesville City Schools said it would be closing all of its public schools for the second day in a row Friday as police investigated the message. 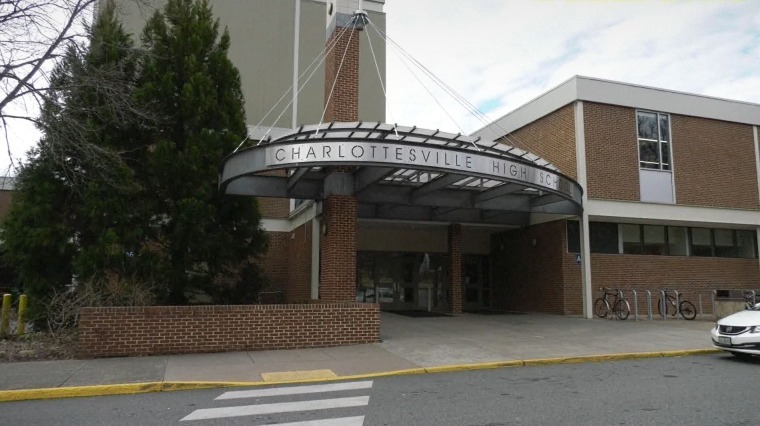 The district also closed schools Thursday after a message was posted on the fringe internet message board 4chan targeting minority students at Charlottesville High School and telling white students to stay home. Charlottesville Chief of Police RaShall Brackney said at a news conference Friday afternoon that the teen, who was not named, identifies as Portuguese and is a resident of Albemarle County. Authorities said during their investigation into the threat, which referred to the "ethnic cleansing" of black and Hispanic high schools students, they learned who posted the message on 4chan and executed a search warrant for the teen's arrest. He faces a felony charge of threats to commit serious bodily harm to persons on school property and a misdemeanor charge of harassment by computer. “We want the community to know that any threats made against our schools, credible or not, are taken seriously and will be thoroughly investigated,” Brackney said. “We want the community and world to know that hate is not welcomed in Charlottesville; violence is not welcomed in Charlottesville; intolerance is not welcomed in Charlottesville." Dr. Rosa Atkins, superintendent of Charlottesville City Schools, said the teen is not a student in their district. She said schools will re-open on Monday. "We do not tolerate hate or racism," Charlottesville City Schools said. "The entire staff and School Board stand in solidarity with our students of color — and with people who have been singled out for reasons such as religion or ethnicity or sexual identity in other vile threats made across the country or around the world." Also Friday, a teenager was arrested by police in Albemarle County, Virginia, and charged with one felony count of threats of death or bodily injury for allegedly threatening to carry out a shooting at Albemarle High School, which is a few miles away from Charlottesville High School. Fringe internet message boards including 4chan have become destinations for racist and misogynist content as mainstream social media platforms have in recent years begun to crack down on extremist content. As those communities began to grow, threats and rhetoric originating on the message boards have led to real-world violence. In 2017, a deadly white nationalist rally took place in Charlottesville and claimed the life of Heather Heyer, 32, and injured 19 others when James Alex Fields Jr. plowed his car into a group of counterprotesters. Fields was found guilty in December 2018 of first-degree murder in connection with Heyer's death and five counts of aggravated malicious wounding, three counts of malicious wounding and one hit and run count.